We are in the middle of a move. Since we already moved all the way to Scotland, you would think that I pretty much have this moving thing in the bag. I will spare you the drudgery of listening to me whine about how I cannot be bothered to pack things up to move two miles away, so I am throwing duvets, legos and spatulas willy-nilly into the van and then vomiting them all over our new digs, insuring a sense of TOTAL OVERWHELM on the other side of this move. Forget about it! It’s Friday and I have a new drink to share! I have long been a fan of the basic mojito. If I close my eyes and sit right next to the heater, when I taste that little bit of mint, I can imagine I am far, far away from tiny lego pieces, stray socks and gray skies. 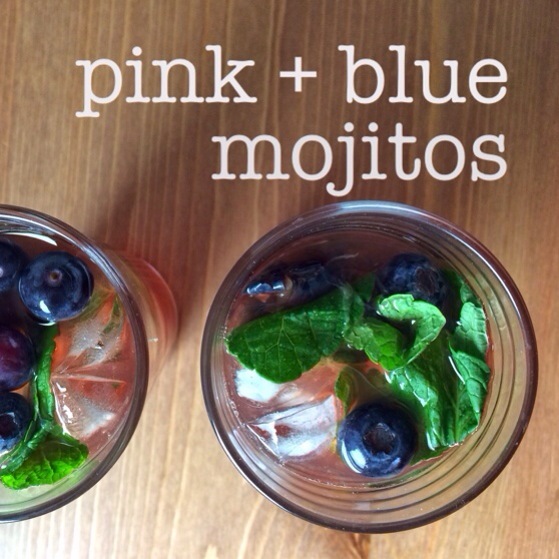 But adding a little color to the mojito? Well, that’s just crazy fun. Taido and I had our own two person party last weekend for Valentine’s Day and this drink played a starring role. Simon had a scouting event on the evening of Valentine’s Day, so I went with Taido to drop him off for the event. We thought we would run and have a drink or a bite to eat together for the hour or so that Simon had to be downtown. But when we got downtown we could not find Simon’s scout leader anywhere at the meeting place. Or any of the other little scouts. After about half an hour, I looked the event up on my phone and ahem, it was actually March 14th, not February 14th. Did I mention that it was dark and rainy? None of us wanted to be out. We stopped at the store on the way home and bought the ingredients for this drink + ice cream for the kids. PARTY! Fill two glasses with ice. Crush 6 mint leaves into each glass and divide the blueberries between the two glasses as well. 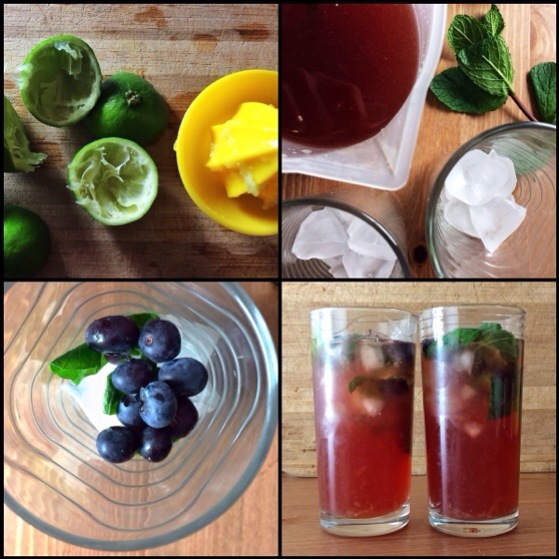 Pour the mojitos over the ice, blueberries and mint leaves. Of course, it goes without saying that you could multiply this recipe and make a pitcher of it ahead of time for a party, in which case I would go ahead and add the mint leaves to the pitcher but still reserve a few for serving. Moving is never fun! We did a local move right before moving to the UK, and I can’t remember how many van loads of “junk” I took to the new house. Hope the end is in sight for you! These look delicious! Hope the move is going smoothly.